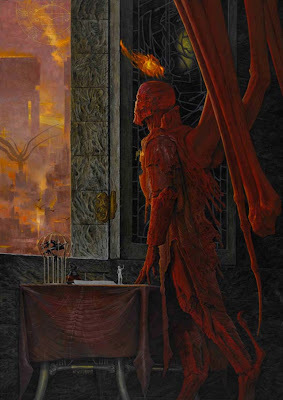 Q: According to your acknowledgments, John Milton’s “Paradise Lost” was a huge inspiration in your art books Barlowe’s Inferno (1998) & Brushfire: Illuminations from the Inferno (2001), and your novel “God’s Demon”. How did your vision of Hell first originate, what did you hope to accomplish initially, and what else influenced the project? Wayne: Back when I was in college, I spent some time reading Dante and conceived of doing a series of paintings exploring his vision of Hell. I never got past the sketch phase of what was to be a very large project but that represented my first relationship with infernal material. The growth of my own Hell work was somewhat less straightforward. After doing a considerable amount of work that I felt was growing stale, I decided, in an effort to garner more emotional reactions, to experiment and painted an image of a being wearing human skins. This inarguably dark painting proved to be pretty disturbing and the response was pretty much what I was hoping for. Shortly after that, I painted The Wargate which set most of the visual templates for what was to follow in my paintings. And then I read Milton. There, before me, was the most visual and magnificent depiction of the underworld that I think anyone has ever created. Filled, as it is, with larger than life characters and settings it set my mind aflame. Here was a world conceived in a fullness that would shame and confound any Hollywood director. I felt that I needed to do the same thing – but different. I’ve never been one to want to play in other peoples yards and so, while I will always acknowledge the powerful influence of Milton, I will also be quick to state that my Hell is very personal, that he made me understand that epic scope was something I needed to play with in my own Hell. With each subsequent painting I tried to add to the visual and narrative layering process. Iconography become more important, my natural history upbringing started to play a role in the designs, my love of ancient history and mythology began to shape the architecture and the characters with whom I populated the streets. And then I started doing serious research into world Hell myths and the fun really began. It became another exercise in world-building – an endeavor I truly love. Q: Regarding “God’s Demon”, when did you know that you wanted to write the novel and why? Wayne: Some years ago, perhaps seven or eight, I wrote a first draft of a screenplay called INFERNO: Rebellion in Hell. This was a response to the many questions I began to get about what tied the very narrative paintings together. Was there a story? Initially, I did not have a clue, but then the ideas that had been collecting around the edges while I was doing all those paintings began to coalesce, the result becoming a screenplay. Astonishingly, this was sold to Fox Feature Animation but was, some time later, given back to me in turnaround when that division shut its doors. That was tough for me and so I let it sit around for a while and then, a few years later, showed it to a director acquaintance who was gracious enough to spend a little time with it during his very busy schedule. He thought it very ambitious but, as it was a first draft, he warned me against showing it around until I’d reworked parts of it. I’m grateful as Hell to him for that advice. He was right – it was rough and needed work. But, I felt that if I was going to spend all that time rewriting it I might as well try to tell the story with as much attention to detail as possible and, to me, that meant attempting to write a novel. The screenplay was invaluable for its pacing and the visuals and served as the skeleton for “God’s Demon”, the novel. But by the time I began to write it I had numerous index cards filled with additional ideas and these added a lot to the process. Q: I believe that “God’s Demon” was your first actual novel. What was the hardest part of writing your book? Did you learn anything from writing “God’s Demon” and what was it? Wayne: A better question might be “Was there ever an easy moment writing “God’s Demon”?” The answer is firmly “No!” I will always say that it was the hardest thing I’ve ever attempted. There were days (infrequent) that I thought I was writing well but that is the most I will say about the positives in the book’s creation. Most of the time it was hard, really hard. And that was not when I had to do a film job or some painting. Then it bordered on impossible. I had one long film job where I had to live in a hotel for four critical months while I was writing and I was nearly in tears on the weekends, trying feverishly to keep the momentum going. I couldn’t, so I resorted to grudging self-editing. After all of these trials my respect for people who write well and prolifically could not help but grow. As for what I took away from the process of writing, well, that’s multi-layered. The craft of writing has its parallels to art inasmuch as there seems to be correlates to blocking in the subject and refining and adding atmosphere, etc. This was fascinating to me, having a foot in each camp. And, not to sound too trite, but I did learn a lot about myself in the course of writing. Q: So what was the most surprising thing that you learned about yourself when writing the book? Wayne: The most important thing I took away from writing "God's Demon" was to be more tolerant of myself. Writing this book was a completely different experience than writing "Expedition" years ago. With that book, I admitted my shortcomings to myself and tried to frame a book around them. I selected a more journal-like format in an almost tacit admission that I could not and would not write a novel. With "God's Demon" I threw that notion out and forced myself to rise to the occasion - the occasion being a signed contract! Kind of like a certain demon named Sargatanas who had to rise to his own occasion. Anyway, throughout the long writing process I found myself questioning my abilities, my decision to write, etc. It wasn't a pretty picture but eventually I trained myself to accept the reality of the situation and to also accept that I would take as long a necessary to finish the book. And finish it I did, but it meant being a helluva lot more patient with myself than I would have ever guessed. I realize that many people write with the same ease that I draw and that this all seems melodramatic in terms of its difficulty. All that I can say is that, for me, it was a real crucible. Q: As an artist, you’ve provided covers for practically every major publisher out there. Did that give you much of an advantage when shopping for a publisher, and could you tell us a bit about how the publisher search went and why you chose Tor? Wayne: I don’t believe that my work for most of the major publishers had any effect whatsoever on the sale of “God’s Demon”. My agent and I shopped it and arrived at Tor largely because my editor, Pat LoBrutto, had a personal affinity for the material. He was a constant support on the project, bringing a pretty broad knowledge of things infernal to the table. Receptivity was my primary concern, in terms of what I was looking for in an editor and he had it in spades. Q: When reading your book I was struck by its level of detail and how vivid it was, which seems to me to be a byproduct of your art. In what other ways did your experience as an artist inform your writing? Wayne: I’m not so sure it was a byproduct of the art as much as a byproduct of my upbringing and my reading and my appreciation for certain artists. The level of detail that you generously allude to is more a reflection of what I liked as a kid and what I read and saw in those early formative years. I was always a pretty detail-oriented kid, immersing myself in one hobby or another. Both my art and my writing tend to harken back—the art to the influences of the late 19th century, the writing more towards the sixties and seventies when I grew up, the last era, in my opinion, when people actually described things in fantasy or SF novels. I love to picture characters, events and places and nothing makes me happier, when I’m reading, than to have an author take the time to be descriptive. I know all of the arguments – it stops the flow, people want to picture things on their own, etc. etc. The eighties seemed to be about eroding all of that in an effort to internalize some kind of dystopic paranoia. Well, that’s not for me and that’s why I’ve always gravitated towards older writing. Which is why it was something of a personal goal to make my world, Hell, as real, by way of description, as possible. Q: Speaking of influences, I noticed there were a lot of familiar fantasy elements in your book like a hierarchy between nobles & peasants, epic war battles, a magic system, court politics, etc. How much of the book was influenced by fantasy literature and by whom? Or is it the other way around…would there be no fantasy literature if not for the Bible, Christian theology, etc? Wayne: I won’t touch that obvious lure into the world of comparative theology! Religion is. It has always played a role in the world, in peoples’ lives and needs to be understood by greater minds than mine to say whether or not it serves as the foundation for fantasy literature. All I will say is that somewhere there is a celestial graveyard filled with the bodies of gods once thought supreme. If that is the stuff of fantasy so be it. Fantasy literature did play a role, albeit not as important a role as it might have done, in the creation of “God’s Demon”. When I was young I read people like Eddison, Tolkien, Lindsay and Wells. They’ve stuck with me and continue to fascinate and inspire. But I would also have to add to the mix of influences by invoking names like Suetonius, Tacitus, and Livy. As I’ve said, I’m a history nut and the sense of timelessness that I get when I read the ancient writers is palpable. I wanted to convey something of that with the temporal scope of my book. I wanted it to feel ancient, almost as if the Romans had written a chronicle of Hell. There were other eras that I kept in the back of my mind, as well, while I wrote. The Elizabethan court intrigues and the events during Cromwell’s era served as valuable touchstones. Court politics are court politics whether they are in England, Rome or China. Or, as I contend, in Hell. And if you have a court, by default, you are going to have a hierarchy with “peasants”. I think that “fantasy” literature has been around since people have put words on stones or papyrus. Clearly, there are elements of fantasy in Homer, Gilgamesh, Plato, you name it. If not used for metaphoric purposes, then those elements were used to entertain. People’s imaginations are no different today than they were three thousand years ago. Only the scope and trappings have changed over the centuries. But the need for dreams and magic and explanations for things we don’t fully understand will always be there. As for magic, it’s odd but I never really considered what the demons create in Hell as magic per se. By definition, I suppose, it is and one could argue that it is the first magic. But are the acts of an angel of legend magic? Is the Bible filled with magic? That would put a radically different spin on things, wouldn’t it? I’m not sure the devout public would agree to such a definition. To me the acts of demons are as much a part of them as are the acts of squid producing ink. It is how they are. But, of course, this is invention, my invention, and I can define their abilities as it seems necessary for the book. Q: You make a pretty good point about the magic. Definitely something to think about… Now, surprisingly, for a book that takes place in Hell, “God’s Demon” is a pretty uplifting story. Why is that? Wayne: My glib answer is that it was the most logical choice to take the plot line in that direction. Hell is a terrible place. Where better to aspire to return to Heaven? While Sargatanas’ arc is not necessarily that unpredictable it does serve as a necessary counterpoint to his dark society and environment. There never was any question that I wanted to tell a story set in Hell. What was questionable was how it could be told that would not be relentlessly dark and Sargatanas’ quest seemed the perfect answer. I am not by nature a person who feels good will triumph over evil but it was very hard, once I’d arrived at this plot, to set it aside. And furthermore, I recognize the appeal of the darker elements in both books and movies. In a sense, Milton himself started the tradition of the anti-hero with his incredible depiction of Satan. Because I was so immersed in showing very dark images to the viewer and because I enjoyed delving into that part of my mind I sought and found a way to frame all of that darkness in a palatable way. Q: As a whole, “God’s Demon” works well as a standalone novel, but the ending leaves plenty of room for sequels. 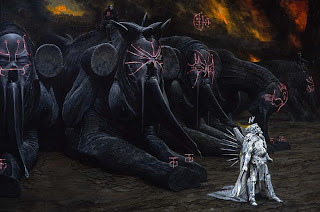 What are your plans for Hell as far as future art books, sequels to “God’s Demon” or other media-related projects? Wayne: Ah, the issue of sequels, or worse, the dreaded trilogy. I’m afraid there may be one. At least I hope so. Not that I’m looking forward to it given how difficult this book was for me to write. But, frankly, there were too many ideas to fit into one book, too many characters each with a story to tell, new characters and, of course, an overarching plot that, in my mind, still needs to unfold. Hell is an incredibly rich and fertile landscape. It has been a playground of the imagination for every culture since people feared retribution. How can I possibly leave it alone? Eventually, I would very much like to see all of the older Hell artwork plus new work between two covers. Before that, though, I’d like to see “God’s Demon” released as a limited edition with artwork. That would, I think, enrich the Hell experience. When I realized that there would be no art other than the cover I was, at first aghast; I knew the book would either sink or swim on the basis of how well I captured the infernal landscape and for a new author that was daunting. No art-crutches to support it. Eventually, this became a positive because it forced me to think like a writer. It probably was more beneficial than I ever imagined. But now, with the book completed, I think layering in the art would not detract from the experience. I am, of course, interested in and exploring any media off-shoots such as films, cable series or games. It’s such a visual world that I think many would be fascinated by its dark wonders. Q: That’s excellent news! I was really hoping you’d write a sequel or two and I think integrating artwork into the novels is a wonderful idea :) “The Orphan’s Tales” by Catherynne M. Valente and Michael Chabon’s “Gentlemen of the Road” immediately come to mind at how well illustrations can enhance the overall experience for readers. Anyways, are you working on any other art books or novels that you could talk about? Wayne: Yes, I am working on another art book that is totally unrelated to Hell. I’d prefer not to elaborate upon it at this early stage but I will say that it plays to my strengths as a designer. And I have begun tapping out words for the second Hell novel. Q: Speaking of other media, your artwork and creature designs can also be found in film (Harry Potter 3 + 4, Blade II, Hellboy), television (Discovery Channel’s Alien Planet, Babylon 5) and videogames (Dead Rush, Prototype). How closely do you get to work with the creators behind these projects and how does the process differ between mediums. Wayne: Generally speaking, I work very closely with directors and producers. I prefer that simply because there is no middleman to act as a filter. I very much like getting guidance directly from the source - directors. Maybe this goes back to my days as an illustrator but I become very mission-oriented when I’m doing Hollywood-related design. I listen very carefully and try to really get a sense of the underlying meanings beneath the words in the script. It’s Golden Rule stuff. How would I like my own written work treated if a room full of designers and illustrators were to go at it? With that in mind I try to respect the original creation as it is presented to me by a director. It’s an attitude I’ve had since I painted paperback covers. I will say that every job has a different texture. The people bring their own dynamics, the projects have their own feel and time limitations always influence the process. Alien Planet was somewhat unique as it was based on my book “Expedition”. I had a lot to say about the initial treatments but Discovery Channel and the production company had more to say. As originally conceived, the show was to be more in line with, say, David Attenborough’s work. More of a nature film with little or no narration. It turned out a bit different. Q: Some of your most recent projects included pre-production artwork for Hellboy II: The Golden Army, The Priest and a film adaptation of “Paradise Lost”, as well as the upcoming Xbox 360/Playstation 3 videogame Prototype. What’s the latest on each of these and what can we expect? Also, what’s it like working with Guillermo del Toro who you’ve collaborated with before (Hellboy, Blade II) and who even left a blurb for your book “God’s Demon”? Wayne: The status of each of those movies is very fluid and can be tracked at IMDB or other similar websites. Hellboy 2 is still filming and will be very cool. Working with GDT is always amazing. 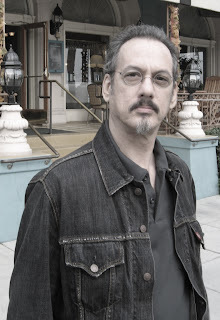 He is one of the most visually astute directors I’ve had the pleasure of working with, a real, certifiable genius with a vision so unique that it’s redefining a genre. He understands the creative process intimately, which makes working for him so much fun. The shorthand is all there and if you have a handle on where he’s going with a concept your own explorations can be pretty interesting. I’ve always enjoyed the process with him and hope to keep our relationship going well into the future. Q: Besides film, television and videogames, you’ve produced pop-up books, children's growth charts, calendars, graphic novelizations, a line of toys, trading cards and your work has been featured in various museums. Is there anything you haven’t accomplished yet creatively that you want to? Wayne: While all of the above is pretty diverse stuff and each was fun to work on, the Holy Grail would be to work on a movie based on “God’s Demon”. While I am thoroughly aware of how costly a film that would be, I am also single-mindedly convinced that there would be a great audience for it. A kind of Lord of the Rings in Hell, if you will. I can think of nothing more exciting than the notion of bringing all of the art and the accompanying story to life in the fullest sense. Most of my other unfulfilled goals center around art, itself. I’d like to sculpt, I’d like to do a series of really big drawings, I’d like to be chained to my easel with none of the prosaic concerns of commerce and just paint. And yes, to answer the many emails I get, I’d like to figure out Thype as a book. It’s the one elusive property I created decades ago (I did a series of paintings and drawings of him when I was in college that appear in the back of Barlowe’s Guide to Extraterrestrials) that has not been revisited. One day, I’ll get it. Q: In your career you’ve had many great job opportunities, worked with tons of amazing creators and so on. Is there any one experience that stands out from others? Wayne: There is but, sadly, I’m not yet at liberty to discuss it. Q: Ah, something recent then ;) Can’t wait to hear about it! With entertainment becoming more technology-based, which in turn is becoming more and more advanced, is the print format in danger of becoming extinct, and what can publishers & authors do to adjust to the changing times? Wayne: I do think that print format entertainment is in some danger of becoming even more marginalized than it already is. People just don’t have enough hours in the day to commit to sitting down and reading the way they used to. They’re seduced by quicker entertainment fixes. And to a large extent I blame the publishers themselves. It was a dark and dangerous day when sales forces in companies across the publishing world began to quietly dictate what editors should be looking for in upcoming titles. SF and fantasy book lists were reduced to make way for TV and film tie-ins and the ability for a new writer to be exposed was severely hampered. That’s never good. So suddenly we had a ton of books that were based on familiar, often derivative franchises and fewer and fewer original titles which led, in my opinion, to a kind of stagnation. Only tried and true properties (including authors) were favored. Not an environment for growth and certainly not a consistent place of excitement for the average reader. Up against that were shiny new computer games (which I love, too! ), movies, TV, and the internet – all of which one could consider instant gratification media. So, what can be done about it now? Probably nothing – the genie’s out of the bottle. I would only recommend that publishers endeavor to take more risks, show us what we haven’t yet seen. And please try to make your books look different than your competitors! As for authors, I’m not sure they can do anything more than what they already do – write. They are the last link – not the first as it should ideally be - in a long and twisted chain that leads into the local mega-bookstore. Q: In some form or another, you’ve been involved with sci-fi/fantasy since the 70s. What are your thoughts on the genres’ evolution since then and where do you see science fiction and fantasy going in the future? Wayne: I don’t think things have gone well with the twin genres and it would seem that sales for all but a few reflect that. I have very anachronistic ideas about SF/fantasy. As I mentioned earlier, I prefer the old-school varieties, heavy on description, less introspective, more gee-whiz. I’m not a fan of either genre when they’re found in contemporary settings. That’s me. I don’t know that the SF/fantasy genre is any more or less acceptable than it has been in the past. I think, for a while, it might have had the ability to break out and become more mainstream but that time is past. If you examine the truly landmark books and films I think they represent mold-breaking paradigm shifts, not just reworkings of tired, old themes. 2001, the “Dune” books, Blade Runner, “Dying Inside” all were standouts for their originality and execution. That kind of stark originality hasn’t come along in a long time. A mere handful of SF/fantasy games are unique enough to have formed their own niches but, by and large, the number of Tolkien and Star Wars clones is unforgivable, a base move to simply capitalize on success. Just how many elf books can one read, how many space-faring rogue bounty-hunter books or lesbian vampire books does it take to make a publisher feel fiscally safe? And people wonder why the genre is stalled and publishing itself is being hurt? The sameness of what’s out there makes me sad. Q: You’re one of the few who can claim to have provided the artwork for their own book. In speculative fiction, cover art is somewhat an issue, especially how important it is in selling a book, how some fantasy covers are considered generic, the difference between international & stateside covers, et cetera. As an artist, what are your thoughts on the subject? Wayne: Well, to be blunt it would have been a deal-breaker if I had not been allowed to do the cover to my own novel! Who would they have gotten? But seriously, the issue of covers is one I have many opinions on and most are complicated. In short though, my philosophy has always been to try to elevate the genre, to lend it the visual credibility that much of it deserves. Both SF and fantasy have been influential genres in ways many people don’t realize. Why not make people feel that what they are holding on the subway is something more than a genre book? My personal belief is that you might see a bump in sales if a genre book was published in a more mainstream package. The devoted genre reader is going to buy it anyway. Back in the sixties, in my opinion, Bantam led the way in cover design across the genres with tasteful, exciting covers that incorporated both good typography and great illustration. Even now, when you look at those covers the quality just jumps out at you. I rarely see anything close to those elegant covers. Of course this is very much a subjective appraisal and most likely not one shared by many people. Last time I was in the UK I stood in a bookstore and looked at the racks and was kind of amazed at the overall, textural difference between the two country’s approaches. It would take too long to go into detail about this but suffice it to say there is a big difference, akin to the accent difference. I like a lot of the overseas work. Maybe even more of it than what I see here. But that could simply be because it is so different and not for any qualitative reason. Q: Are there any preconceived notions that you’d like to dispel about being an artist? What about as a writer? Wayne: All my life I’ve striven to appear to be a “normal” person, not someone who can be identified as an artist or writer by what I wear or what tattoos I have. That’s not me. That is because I believe that creativity is an internal mechanism, something that is so personal that I don’t actually want to telegraph it by my appearance. By all rights, working on Hell material, I should scare people when I show up in a restaurant. That kind of sharing of one’s self makes the assumption that anyone cares. What I create, the paintings, the drawings, the words, that is what I’m all about sharing. People have strange ideas about what it means to be an artist or a writer, ideas that are born of ignorance. When I was a kid, like countless other art-oriented kids I’m sure, I was endlessly asked what drugs I took to come up with what I drew. I resented it. Was it so out of the realm of possibility to create without an external enhancement? I read somewhere that this question plagued H.G. Wells, too. It’s an unfair assumption. So, for anybody out there who cares, I am dependent on something to paint and write. It’s called Imagination. Q: Very well said. So what is the one question that no one ever asks you, but you wish they did, and how would you respond to it? Wayne: “Wayne, did you have plastic surgery or were you really born this handsome?” To that, I would have to roll my perfect eyes. Q: LOL. Besides writing & artwork, what other activities or hobbies do you enjoy? Wayne: I watch a lot of DVD’s, chatter endlessly to my best friend on the phone, paint 54mm Romans, build tank kits, read, brood – the usual. Q: So what’s in your book pile? Wayne: I’m very picky these days about what I read. I mostly enjoy non-fiction history, a category which tends to inform my Hell work. I’m reading James Reston, Jr’s “Warriors of God” right now. I also read Steven Pressfield – I’m in the middle of his “Afghan Campaign” which I really like. Richard K. Morgan’s “Thirteen”, and Iain Banks “Algebraist” are atop the pile. I admire both of these authors’ work for their unique and consistent visions as well as the skill with which they write. And I go back to David Wingrove’s “Chung Kuo” books when I’m in the mood. They are one of my favorite contemporary series of SF and I believe are vastly underappreciated. Q: I definitely think you’ll like “Thirteen” J It’s impressive. So, is there anything else you’d like to say? Wayne: Other than “Thank you” for your interest in “God’s Demon” and for the opportunity to share some of my thoughts, no. Good interview Robert. You can see it will take several years before we will see a second book though. I was wondering, the right hand panel that shows what you were reading showed The Scalding Rooms and Slaves of the Shinar last week, but now both are gone. Will you be reviewing them? Yeah, what happened to those two books. I was looking forward to reading the review of the two books. As far as the Scalding Rooms and Slaves of the Shinar, both of them have been read & reviewed and you'll see them posted in the next few weeks with a couple of already completed interviews, etc. Almost finished with God's Demon... fantastic book. I love it. 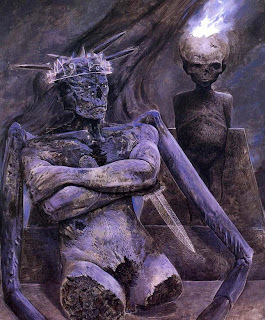 I'm so impressed by Barlowe's vision and it's verbose realization... I have all the art books, but vascillated on getting GD. I'm glad I did... I can't put it down. Fantastic interview. I just finished reading the book (well, technically I listened to it on audiobook), and loved it! I had followed Barlowe's art for a few years and was always blown away by his Hell work, so having a novel from him is a treat. And I agree with him, I would Love to see "God's Demon" as a big-budget film!